This book in the Coast Lines Key Ancestors series, Nick Robins and Malcom McRonald take us through the history and development of the alliance of Burns and Laird. Coast Lines was for a time one of the great success stories of British Shipping. Focussing on the coastal liner trades, the group dominated its chosen sector of business more successfully than almost any other shipping company in the United Kingdom. This book is the third in the trilogy examining the companies from which Coast Lines emerged. 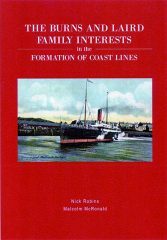 The influence of the Burns and Laird families was huge as passenger travel on coastal vessels grew rapidly in the late Victorian era. The authors have been able to reconstruct a vital part of the prehistory of Coast Lines and to compile a collection of photographs of the ships involved. This is an outstanding book backed up by numerous high quality photographs and I would very highly recommend it to our readers.